I really enjoyed this re-read. There was a lot to re-discover and a lot that I had missed on the first read, such as Pratchett getting the hang of fleshing out characters and interactions between his characters. Equal Rites is not widely regarded as one of Pratchett's better books in the Discworld series and it is usually even set apart from the rest of the Witches sub-series, but I really like this book. We get to learn a lot about the background to the Unseen University, Wizards, Witches, and Granny. 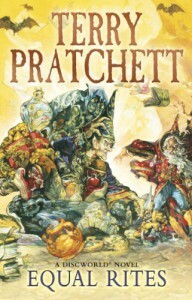 And even tho the plot takes a while to get going, there are enough little pieces of Pratchett's magic in this one to make the book delightful, but one has to pay attention to the detail...and be a little patient while watching the characters take on shape. There is a lot about shapes and things evolving to take shape in this book - from the evolution of female wizards, to ideas taking shape and becoming a reality, to a Discworld version of Flatlands, to Granny cutting a fine figure (in Cutangle's mind) ... hehe. Yup. I thoroughly enjoyed this.